Psalm 110:4 The LORD has sworn and will not change his mind, "You are a priest forever according to the order of Melchizedek." Is the Priest capable of forgiving sins? Can women be ordained as Priests? A Priest is defined as one who offers sacrifices for the forgiveness of sins. If we look at the Old Testament we find a lot consecrated men who served the Lord and His people, they offered prayers and sacrifices in atonement for the sins of their people. Different religions have priests to pray and follow rituals representing groups of people, but there is only one true religion instituted by God Himself hat follows the true Shepherd, the true Priest of Priests, Our Lord Jesus Christ, our only Salvation. The Priesthood is a noble vocation inspired by God to men of good will, who are willing to leave the world and its enchantments behind, in order to lead the people of God to Salvation. In the Catholic Church, a Priest has been anointed by the sacrament of Holy Orders and receives the dignity of consecrating the bread and wine, to turn it into the body and blood of Christ. He also receives the commission to preach the Gospel and to administer the Sacraments; He is especially anointed to forgive sins in the Sacrament of Confession. The anointing received by a Catholic Priest comes from Christ, it has been passed to the Apostles and then to all priests through the action of the Holy Spirit by the laying of the hands. Acts 8:17 Then Peter and John laid their hands on them, and they received the Holy Spirit. 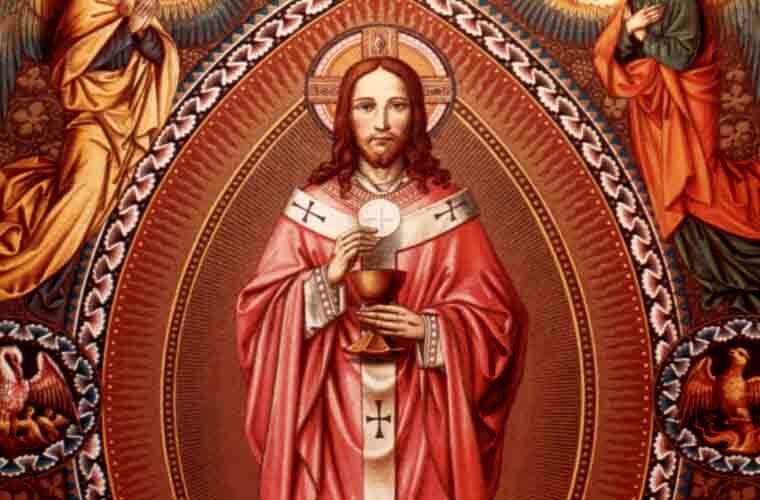 Our Lord Jesus Christ is the Priest of Priests, the Highest Priest of the Order of Melchizedek, who offered prayers and His life as a sacrifice for the sins of all mankind. Hebrews 6:20 where Jesus, a forerunner on our behalf, has entered, having become a high priest forever according to the order of Melchizedek. 1Peter 2:9 But you are a chosen race, a royal priesthood, a holy nation, God's own people, in order that you may proclaim the mighty acts of him who called you out of darkness into his marvellous light. In the common Priesthood, we have been called to be like Jesus, to minister to one another, to pray and to offer sacrifices for our sins and the sins of the whole world. We can do this through many different devotions, but mainly through the offering of the Holy Mass. We are also called to be prophets of the Most High, a prophet is one who speaks with the Word of God, The Holy Spirit gives the faithful different gifts including the gift of Prophecy, which consists in speaking with the words of God. In Baptism, we are commissioned to preach the Word of God by our example. Catechism C.C. 783 Jesus Christ is the one whom the Father anointed with the Holy Spirit and established as priest, prophet, and king. The whole People of God participates in these three offices of Christ and bears the responsibilities for mission and service that flow from them. Christ is the King of kings, we are his servants, that is why we call Him Lord. The Ministerial Priesthood is only available to those men chosen by the Grace of God with the Holy Vocation, and is conferred to them through the Sacrament of Holy Orders, by the anointing of a Bishop, whose anointing comes directly from Christ. Priests are empowered to administer the seven Sacraments in the Holy Catholic Church. The Priest has been commanded by Christ to forgive sins, through the Holy Anointing of the Sacrament of Holy Orders, he becomes empowered by Christ himself to forgive sins. John 20:23 If you forgive the sins of any, they are forgiven them; if you retain the sins of any, they are retained." On the night of the Last Supper, Jesus established the New Priesthood instructing His Apostles about the service and humility they would have to offer to His sheep, He told them that He was not going to be with them any longer. He washed his disciple's feet as a sign of humility and service; he asked them to imitate him. He gave them the new commandment to love one another as He had loved them. He predicted that He was going to the Father, but He gave them the consolation of knowing that He is the way to the Father, He also said that He is in the Father and the Father is in Him, that anyone who sees Him, also sees the Father, (John 10:30 The Father and I are one) . He also predicted that the Father would send the Holy Spirit to be our advocate forever the One who would teach us all things. John 15:5 He also said that He is the true vine and we are the branches. (John 15:6) Whoever does not abide in me is thrown away like a branch and withers; such branches are gathered, thrown into the fire, and burned. Jesus prayed that just as the Father and Him are one, we should be one. Mat 26:26 While they were eating, Jesus took a loaf of bread, and after blessing it he broke it, gave it to the disciples, and said, "Take, eat; this is my body." Although the words of God have their own inherent force; yet the more sweet and acceptable manner of communicating with the ignorant and the unskilled in divine mysteries is by means of the priest. 300. Likewise it was proper that the dignity and honor of the priesthood should receive its due; for the Most High holds the priests in such esteem, that if He finds them in the right disposition, He exalts them and fills them with his Spirit in order that the world may venerate them as his chosen and anointed ones. More over the wonders of the Lord run less risk in priests, even when they are more openly revealed to them. If they live up to their dignity, their works in comparison with those of the other creatures, are like those of the angels and of the seraphim. Their countenance should be resplendent, like that of Moses, when he came forth from converse with the Lord (Exod. 34, 29). At least they should deal with the rest of men in such a manner that they be honored and revered as next to God. I desire that thou understand, my dearest, that the Most High is greatly incensed against the world in this matter: as well against the priests as against laymen. Against the priests because, forgetting their exalted dignity, they debase themselves by a contemptible, degraded and scandalous life, giving bad example to the world by mixing up with it to the neglect of their sanctification. And against the laymen, because they act with a fool hardy presumption toward the anointed of the Lord, whom, though of imperfect and blameworthy lives, they ought to honor and revere as taking the place of Christ, my most holy Son, on earth. 1Ti 2:11 Let a woman learn in silence with full submission. 1Ti 2:12 I permit no woman to teach or to have authority over a man; she is to keep silent. 1Co 14:34 women should be silent in the churches. For they are not permitted to speak, but should be subordinate, as the law also says. 1Co 14:35 If there is anything they desire to know, let them ask their husbands at home. For it is shameful for a woman to speak in church. So we conclude from the Word of God that even though the Church has been lenient by granting many privileges to women, those did not exist in the early Church. So when it comes to the question of ordaining women as Priests, the answer is a big NO. In 1994 the Holy Father John Paul II made a formal declaration stating that the Church is powerless to ordain women as Priests. He stated, "Although the teaching that priestly ordination is to be reserved to men alone has been preserved by the constant and universal tradition of the Church and firmly taught by the magisterium in its more recent documents, at the present time in some places it is nonetheless considered still open to debate, or the Church�s judgment that women are not to be admitted to ordination is considered to have a merely disciplinary force. Wherefore, in order that all doubt may be removed regarding a matter of great importance, a matter which pertains to the Church�s divine constitution itself, in virtue of my ministry of confirming the brethren (cf. Luke 22:32) I declare that the Church has no authority whatsoever to confer priestly ordination on women and that this judgment is to be definitively held by all the Church�s faithful" (Ordinatio Sacerdotalis 4). In 1995 the Congregation for the Doctrine of the Faith, in conjunction with the pope John Paul II, ruled that the teaching of women not being ordained as Priests "requires definitive assent, since, founded on the written Word of God, and from the beginning constantly preserved and applied in the tradition of the Church, it has been set forth infallibly by the ordinary and universal magisterium. "It is not permitted for a woman to speak in the church [1 Cor 14:34�35], but neither [is it permitted her] . . . to offer, nor to claim to herself a lot in any manly function, not to say sacerdotal office" (The Veiling of Virgins 9 [A.D. 206]). "When a widow is to be appointed, she is not to be ordained, but is designated by being named [a widow]. . . . A widow is appointed by words alone, and is then associated with the other widows. Hands are not imposed on her, because she does not offer the oblation and she does not conduct the liturgy. Ordination is for the clergy because of the liturgy; but a widow is appointed for prayer, and prayer is the duty of all" (The Apostolic Tradition 11 [A.D. 215]).